Lunar Orbit – Orocrea Jewerly s.n.c. A piece of sky on your chest. 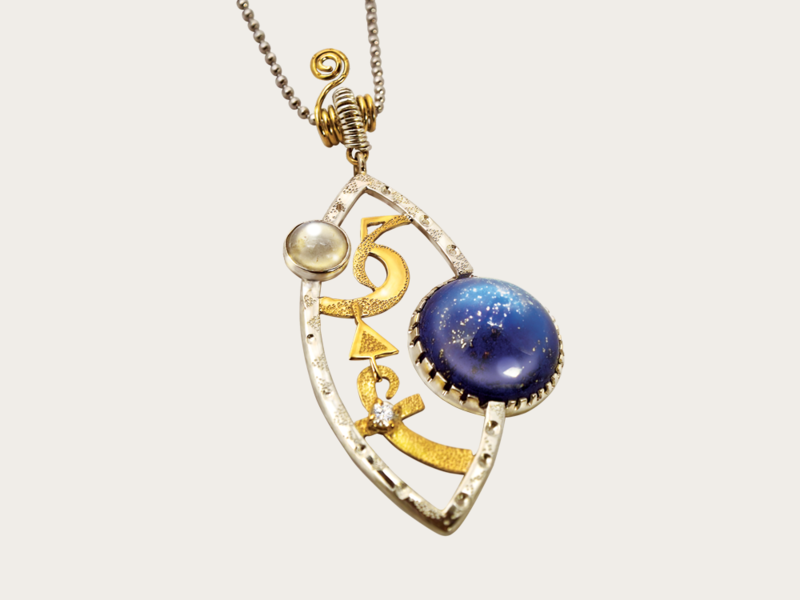 Can you see in this pendant a blue giant star from a lapislazuli gem? And a little white moon from a moon stone? In yellow 18 kt gold you have the story of the sacred feminine energy expressed in all her fiery nature. The shimmering and pure diamond inside the symbol in sacred language for “being”, the ideograms of “fire” and of “feminine energy”, complete the story of the book you can read every time you look at this marvellous jewel. The Selfic preparation attracts synchronicity and positive events.